The key factor augmenting the global industrial protective clothing fabrics market at the moment is the increasing awareness within the industrial sector in emerging economies regarding workplace safety. Asia Pacific is expected to play a particularly strong hand in the future of the global industrial protective clothing fabrics market in terms of demand and growth rate. This market is also earning the support of governments concerned over national mortality and injury rates in the industrial sector. However, the market is also being restricted by issues such as the extremely high cost of flame-resistant fabrics, which are becoming a necessity in several industry areas. The global industrial protective clothing fabrics market is expected to expand at a CAGR of 6.8% within a forecast period from 2016 to 2024 in terms of revenue. This revenue is expected to reach US$2.24 bn by the end of 2016 and US$3.36 bn by the end of 2024. Of the many application segments of the global industrial protective clothing fabrics market, oil and gas has so far been highly promising in terms of demand and scope of growth. In 2015, the oil and gas sector accounted for 20% of the overall demand for industrial protective clothing and clothing fabrics. With a majority of workers in the oil and gas sector being exposed to harsh environments and hazardous conditions, the highly stringent safety standards coupled with the need to increase crude production levels have proven beneficial for players in the global industrial protective clothing fabrics market to ramp up their production rates. This, however, may not be the case entirely, as there is currently a sluggish rate of growth in the oil and gas sector in terms of launching and operating oil rigs. While this could be mitigated by the growing demand for industrial protective clothing fabrics in shale drilling, manufacturers in the market are already looking to other segments such as welding and mining for better growth options. These segments are expecting to show a greater demand for industrial protective clothing fabrics over the coming years due to growing precautionary measures and regulatory safety regulations being implemented. Asia Pacific is expected to lead the global industrial protective clothing fabrics market in terms of growth rate and scope of opportunities among all key regions. Between 2016 and 2024, Asia Pacific is expected to show an excellent CAGR of 7.8%, allowing quite a few globally prominent players to put their faith in this regions for growth. The industrially evolving countries of Asia Pacific – especially China and India – are expected to be instrumental to the growth of the global industrial protective clothing fabrics market over the coming years. The leading region in the global industrial protective clothing fabrics market in terms of overall size in 2015, was Europe. With a share greater than 35% of the global industrial protective clothing fabrics market’s value, Europe continues to be a promising region for all types of manufacturers in this market, owing to the extremely high safety standards laid down by governments and regional regulatory authorities. The top players currently taking up the higher shares in the global industrial protective clothing fabrics market in terms of value, include Solvay S.A., PBI Performance Products Inc., Teijin Aramid B.V., Koninklijke Ten Cate nv (TenCate), Huntsman International LLC, Gunei Chemical Industry Co., Ltd., Milliken & Company, and Glen Raven, Inc. This report analyzes and forecasts the market for Industrial Protective Clothing Fabrics at the global and regional level. The market has been forecast based on revenue (US$ Mn) from 2016 to 2024, considering 2015 as the base year. The study includes drivers and restraints of the global Industrial Protective Clothing Fabrics market. It also covers impact of these drivers and restraints on demand for Industrial Protective Clothing Fabrics during the forecast period. The report also highlights opportunities in the Industrial Protective Clothing Fabrics market at the global and regional level. The report includes detailed value chain analysis, which provides a comprehensive view of the global Industrial Protective Clothing Fabrics market. Porter’s Five Forces model for the Industrial Protective Clothing Fabrics market has also been included to help understand the competitive landscape in the market. The study encompasses market attractiveness analysis, wherein end-users are benchmarked based on their market size, growth rate, and general attractiveness. 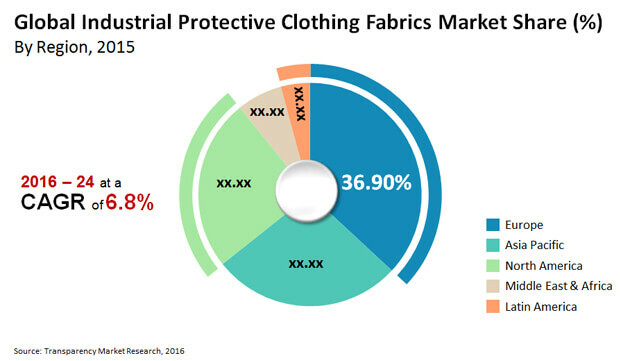 The study provides a decisive view of the global Industrial Protective Clothing Fabrics market by segmenting it in terms of end-users such as building & construction, electrical, plastics, automotive, lubricant additive, and others (including rubber goods). These segments have been analyzed based on present and future trends. Regional segmentation includes current and forecast demand for Industrial Protective Clothing Fabrics in North America, Europe, Asia Pacific, Latin America, and Middle East & Africa. The report provides the actual market size of Industrial Protective Clothing Fabrics for 2015 and estimated market size for 2016 with forecast for the next eight years. The global market size of Industrial Protective Clothing Fabrics has been provided in terms of revenue. Market revenue is given in US$ Mn. Market numbers have been estimated based on key end-users of Industrial Protective Clothing Fabrics. Market size and forecast for numerous end-users have been provided in terms of global, regional, and country level markets. Secondary research sources that are typically referred to include, but are not limited to company websites, annual reports, financial reports, broker reports, investor presentations, SEC filings, internal and external proprietary databases, and relevant patent and regulatory databases such as ICIS, Hoover’s, OneSource, Factiva and Bloomberg, national government documents, statistical databases, trade journals, market reports, news articles, press releases, and webcasts specific to companies operating in the market. The report comprises profiles of major companies operating in the global Industrial Protective Clothing Fabrics market. Key players in the Industrial Protective Clothing Fabrics market are PBI Performance Products Inc, Solvay S.A., Koninklijke Ten Cate nv (TenCate), Teijin Aramid B.V., Gunei Chemical Industry Co., Ltd., Huntsman International LLC, Milliken & Company & Glen Raven, Inc. Market players have been profiled in terms of attributes such as company overview, financial overview, business strategies, and recent developments.